As we head into Week 10, it’s time again for our weekly look at the fantasy football players on the rise or fall in the weekly rankings. The calendar has hit November and we are entering the stretch run of the fantasy regular season. As each week goes by, we have new information that is presented to us and it requires careful consideration. You don’t have much time to reflect before you must turn the page to the following week of action. The first step in that transition is assessing which players are on the rise and which ones are falling in the fantasy rankings coming out of the weekend. Ryan threw for 350 yards and four touchdowns in a win over the Redskins. He was intercepted for the first time since Week 2. Ryan has done a great job of taking care of the football and now boasts a 19:3 TD:INT ratio. … FitzMagic returned in a big way for fantasy owners, though it didn’t necessarily translate into success for the Buccaneers. Fitzpatrick finished the week as a top-five quarterback, completing 24 of 40 attempts for 243 yards, four touchdowns and two interceptions in a loss at Carolina. 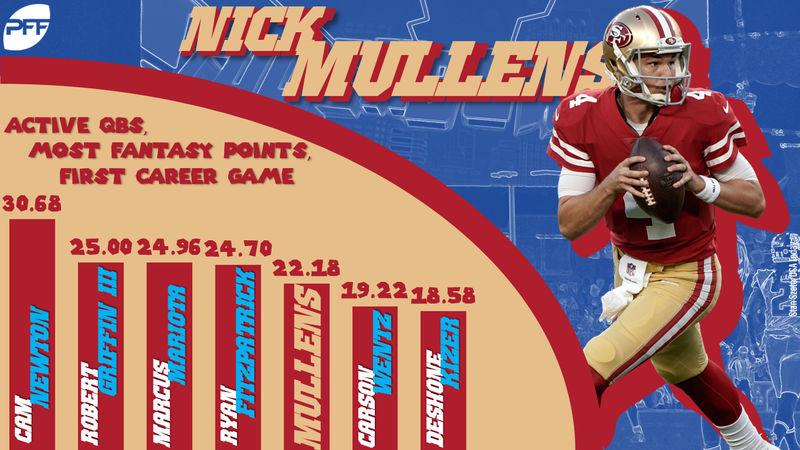 … Hardly any fantasy owners had heard of Mullens before Thursday, but after throwing for 262 yards and three touchdowns against the Raiders he could be in line for another start under center for the 49ers in Week 10 against the Giants. Kamara scored three first-half touchdowns and turned 23 touches into 116 total yards while racking up 0.87 PPR points per opportunity. 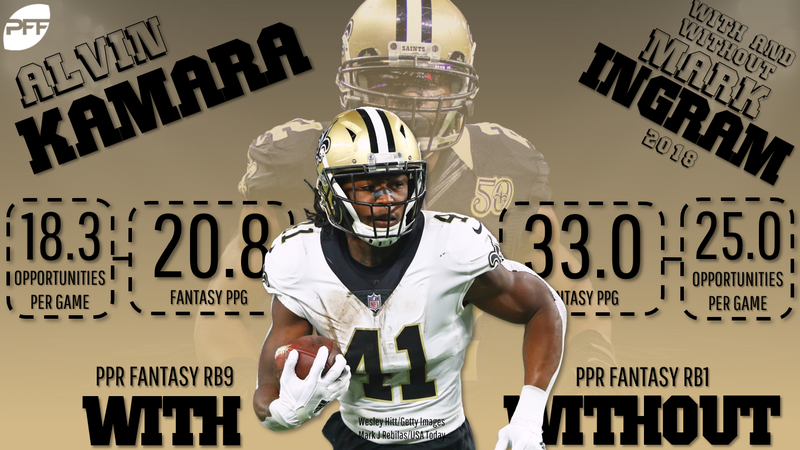 Since Mark Ingram’s return in Week 5 Kamara ranks as RB9 despite having a bye week. … In what was a bit of a surprise, Cook played in Week 9 versus the Lions. Despite being on a “pitch count,” he registered 89 yards on 10 carries and pulled in all four of his targets for 20 yards on 28 snaps. Cook could be a factor after his Week 10 bye. … Coleman turned in his best fantasy effort of the season, including a surprising five catches for 68 yards and two touchdowns receiving. Coleman has now scored four times over his last three contests and should be able to keep it rolling vs. Cleveland in Week 10. … Once Chris Carson (hip) went out, Davis stepped in and delivered 107 total yards on 22 touches. He’ll offer RB2 value if Carson is out of action in the weeks ahead. … New offensive coordinator Freddie Kitchens didn’t waste time getting Johnson involved as he finished with his first top five PPR weekly finish since Week 4 of 2015. With Will Fuller (knee) out for the season and Keke Coutee (hamstring) inactive, Hopkins saw 50% of the Texans’ targets and delivered an 83.3% catch rate while posting a 10/105/1 stat line. The high volume should continue even if the team adding Demaryius Thomas. … The Rams welcomed back Kupp in Week 9 at New Orleans and the wideout responded with a top-10 fantasy finish and a solid 14.8 yards per target. … Don’t look now, but Gordon has hit 100 yards in two of his last three games for the Patriots and his 55-yard TD catch on Sunday night ensured his best fantasy output of the season. … Don’t sleep on Ridley. After not scoring since Week 4, the rookie found the end zone and pulled in six of nine targets for 71 yards against the Redskins. … Baldwin finished with his second double-digit fantasy day in three weeks. With matchups against the Rams and Packers over the next two weeks the gamescript could work in his favor. It appears as if Kittle is quarterback proof. He finished as a top-10 tight for the sixth time in nine weeks, including three top-five performances. With Mullens under center on Thursday night he reeled in all four of his targets for 108 yards and a touchdown. … Olsen (foot) still isn’t 100%, but he now has scored 15-plus PPR points in back-to-back games after finishing with a 6/76/1 stat line in Week 9. … No tight end had a bigger breakout Week 9 performance than Heuerman of the Broncos. He was targeted an astonishing 11 times and finished with 83 yards and a TD against Houston. With Stefon Diggs (ribs) inactive, Cousins sputtered against the Lions. He only threw 22 passes on the day, finishing with 164 yards and a touchdown. After throwing for multiple TDs in three of his first four games as a Viking, Cousins was held to just one TD pass for the third time in his last five. … Stafford was sacked 10 times and failed to find the end zone in the other side of the NFC North matchup. 11 of his 36 attempts were thrown behind the line of scrimmage leading him to finish with a league-worst 4.3 average depth of target in Week 9. … The rough rookie campaign of Darnold continued in Week 9 at Miami as he was picked off four more times. He leads the NFL with 14 interceptions. Gamescript came back to bite owners of Peterson again in Week 9. Once the Redskins fell behind, Peterson’s opportunities diminished. He only ended up with 17 yards on nine carries. To make matters worse starting guards Brandon Scherff (pectoral) and Shawn Lauvao (knee) sustained season-ending injuries in the loss. … McCoy finished with only 10 yards on 10 carries with Nathan Peterman under center as the Bills welcomed the Bears. 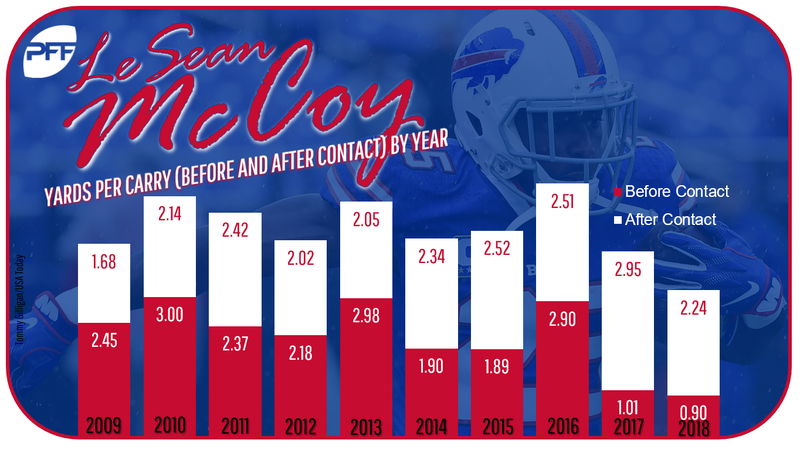 Over his past three contests McCoy has totaled 24 yards on 24 carries, so at least he’s been consistent. … While he remains a fantasy asset, Ekeler hasn’t been consistent enough to consider as a weekly flex option just yet. He’s not offering the production as a receiver he displayed early on with one or fewer catches now in three of his last four games. … The arrival of Ty Montgomery might have the final blow to any fantasy value that was remaining for Allen. Even with Montgomery inactive he failed to reach double-digit fantasy points for the third time in four weeks after he accomplished the feat in four of his first five outings. Evans struggled to find a rhythm in Week 9 versus the Panthers and caught just one of his eight targets. After coming off back-to-back monster games owners, were reminded of how low Evans’ floor is capable of being. … Despite trailing much of the day, Brown only saw five targets, finishing with three catches for 15 yards. He now has three or fewer catches in five of his nine contests and exceeded five catches once all season. … Owners who raced to grab Parker off the waiver wire and put him into their lineups against the Jets got burned. A week after his career-best effort, Parker returned to his norm by producing one reception on two targets for eight yards. … Like most of the Raiders, it’s time to send Nelson packing. After a few solid outings in Weeks 3-5, Nelson has sputtered of late. He was expected to see a fantasy uptick when Amari Cooper was traded to Dallas, but in the two games he’s played since the deal he has a combined three catches for 30 yards. Despite playing in every game this season, Reed is currently TE13 in PPR leagues. He ranks eighth among tight ends in targets (47) but hasn’t made his way into the end zone since Week 1 and he is still searching for his first 70-yard game of the year. … It will be hard to trust any player wearing an Oakland uniform down the stretch and Cook can add his name to that list. He had two catches for 20 yards in Week 9 at San Francisco and has failed to break the 20-yard mark in three of his last four games.